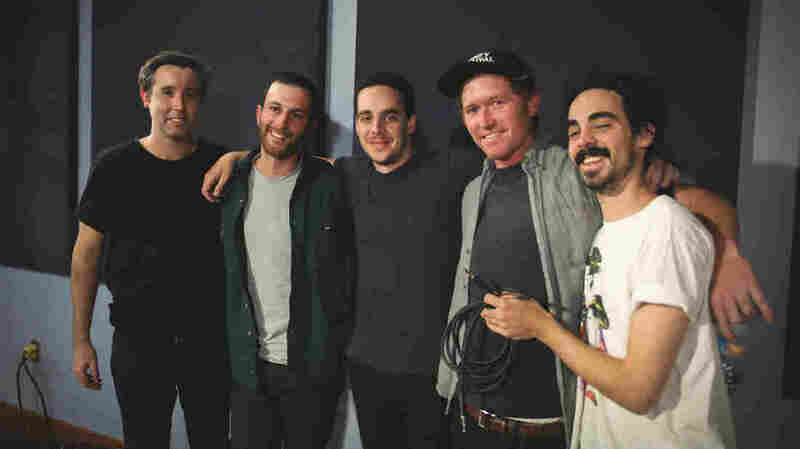 Rolling Blackouts Coastal Fever On World Cafe : World Cafe The Melbourne band consists of a pair of brothers and a pair of cousins, plus one. Hear its Cinderella story — from playing bedroom jams to signing with Sub Pop — in this session. Rolling Blackouts Coastal Fever inside the World Cafe studio. "We all had that same feeling ... when we were teenagers, looking on the back of a Nirvana record or something and seeing the Sub Pop thing," says guitarist Joe White. "And it's such a cool label. And then, yeah, then it was on the back of ours." Rolling Blackouts Coastal Fever's first EP won high praise from SPIN, Stereogum and Pitchfork. In this session, the band performs songs from its latest, The French Press. Hear the conversation and performance in the player above.